Washington WR John Ross runs fast. 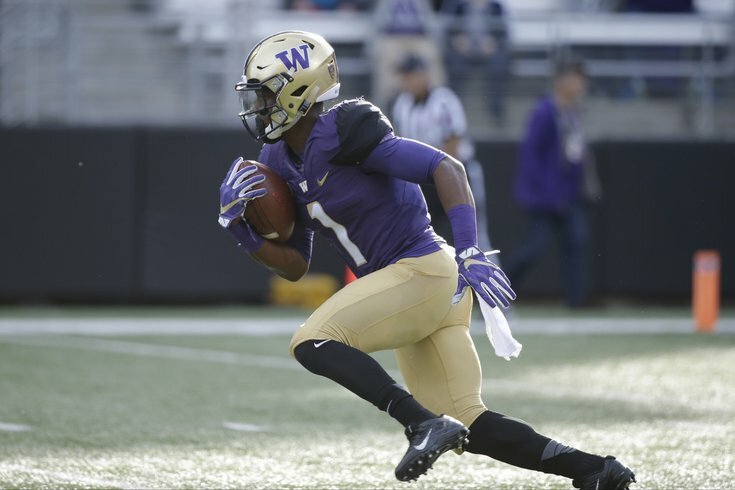 John Ross, WR, Washington (5'11, 190): (4) Washington at (17) Utah, 3:30 p.m.
Washington has blown out almost everyone it has faced this season, outscoring its opponents 338-102. As such, the Huskies have not needed their passing attack in the second half of their games, rushing 271 times this season and only attempting 185 passes. Ross' numbers have been affected by that. On the season, he has 34 catches for 486 yards (14.3 yards per catch) and 9 TDs. The Eagles don't currently have a receiver who has shown he can consistently take the top off a defense. If they're comfortable with his medicals, Ross could be a target. Vita Vea, DT, Washington (6'4, 322): Washington at Utah, 3:30 p.m. The week of the Dallas game feels like a good time to profile Vea, who is a dominant run stuffer along Washington's defensive line. Run stuffers have become devalued in the NFL to some degree, but with Bennie Logan slated to become a free agent this upcoming offseason, combined with the fact that two of the Eagles' division rivals -- the Cowboys and Redskins -- have dominant run blocking offensive lines, a run stuffing defensive tackle could make sense for the Eagles. Vea has played approximately 40 percent of his team's snaps this season, but he is a better pass rusher than he is given credit for, much like Logan. If you try to single-block Vea, he can simply overpower interior offensive linemen and walk them back into the pocket. Vea is redshirt sophomore, so there's certainly a chance he could stay in school for another season, but if he comes out, he'll likely be a Day 2 pick. OK, so nobody is actually going to watch Western Kentucky vs. Florida Atlantic, but I wanted to profile Taywan Taylor, so we'll shoehorn him in. Like Ross above, Taylor has blazing speed, as FOX's Bruce Feldman named him the No. 5 freak athlete in the country, citing Taylor's 11'5 broad jump, a 39.5" vertical and a 4.33 40. Taylor has also been highly productive the last two years. In 2015, he was third in the nation with 1467 receiving yards and second in the nation with 17 receiving TDs. Those numbers dwarfed those of 2015 teammate TE Tyler Higbee (38-563-8), who was a fourth-round selection of the Rams in the 2015 NFL Draft. Spoiler: We'll be profiling a lot of receivers who run fast. Montravius Adams, DT, Auburn (6'3, 309): (15) Auburn at Ole Miss, 7:30 p.m. In watching a lot of SEC offensive linemen and running backs over the last three years during this "Grocery Shopping" series, one player who always seemed to flash on the other side of the ball was Adams. However, when I finally got around to specifically watching him, I was a little disappointed. The reason he is so noticeable when you're not necessarily watching him is because his get-off at the snap is extremely impressive. His explosive first step allows him to get the upper hand to begin most snaps. However, he ends up on the ground far, faaaaaar too often. For example, here's his game against LSU last year. He's on the ground at least 15 times, which is maddening. That is great production. He also had the blocked PAT that essentially won a game for Florida State over Miami this year. The Eagles are going to be shopping for pass rushers this offseason, as their defense is so much more effective (as is any defense, duh) when they can pressure the quarterback without having to blitz.